The emission of greenhouse gases will cause a rise in the earth’s atmospheric temperature which ultimately leads to increased damage to Human health and Ecosystems. This overview will focus on the human health effects only. A marginal approach for calculating the characterization factors is followed, meaning that the additional impact of a marginal increase in greenhouse gas emissions using today’s situation as the reference state. Impact is measured in disability adjusted life years for human health (DALYs). 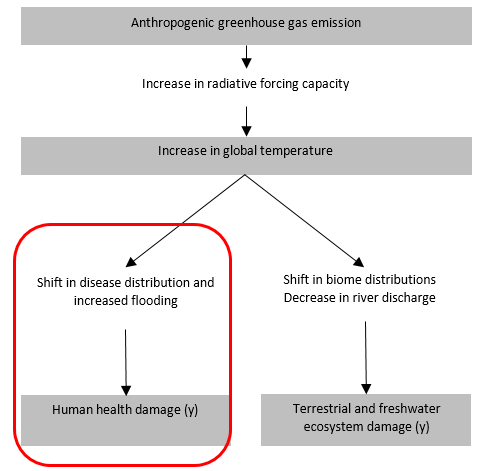 where GWP is the Global Warming Potential of greenhouse gas x. TH is the time horizon δTEMP is the temperature increase due to the release of 1 kg of CO2 and EF is the effect factor for a given Area Of Protection (AOP), in this case Human Health. GWPs are used to compare the effect of different greenhouse gases relative to the reference gas (CO2), because the atmospheric lifetimes of greenhouse gases differ they are time-horizon dependent. By multiplying the GWP (in kg CO2 equivalents) by the effect of CO2 on the global temperature increase and the effect factor of a temperature increase on human health can be obtained.